Good morning! Ardyth here with a fun card and a simple 'trick' for making the magnifying glass looking like it's actually magnifying some of the hearts in my rainbow row - I used a bigger die! rainbow colours. The last large heart was coloured with the adjoining colours on each edge. I cut each edge off the heart and lined up my row in order. I cut 3 layers of the magnifying glass (plus an extra layer in silver for the detail) and glued them together for some dimension. I placed the magnifying glass over the larger area and trimmed down the extra bits so that they didn't peek out behind the glass. I stamped my sentiment and then gave the hearts some shimmer with Wink of Stella before I popped up the magnifying glass over the hearts. 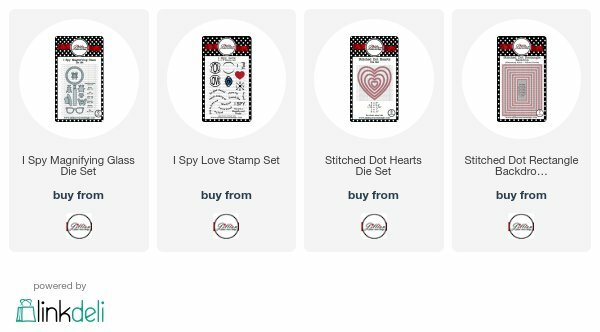 Don't forget that there is a real deal on I Spy Love right now! That is an AWESOME card!! So clever!